You are currently browsing the category archive for the ‘Decorative Containers’ category. Hi everyone! This week’s question that I’m going to share is an excellent one. Especially since there are so many photos on Pinterest and other sites that don’t offer any explanation or instructions on how to plant various plants. Yes, indeed. 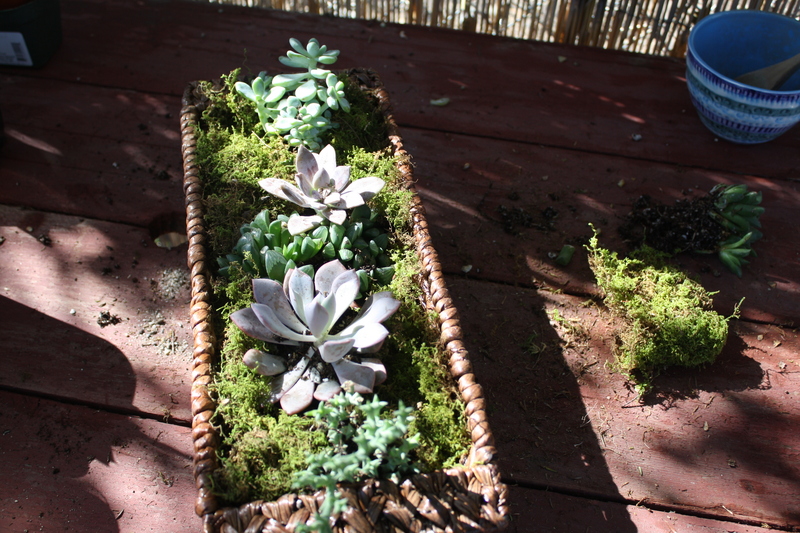 You see succulents planted in jars, in vases, in old coffee cans, shoes, soda bottles – on and on. What’s the deal with that? She has a good point – don’t they need drainage holes? Leave your best advice in the comments section, or on my facebook wall. I’ll reveal your answers tomorrow, as well as sharing what I actually wrote her back. Hope to see you back here! It’s not even Halloween yet but I’m already thinking about Christmas gifts. I like to make my own gifts if I can, because I believe homemade gifts are more thoughtful. But also because they’re less expensive. Families across the country are on tight budgets. If you’re running one of them, you should consider entering this fabulous contest from Timber Press. You and your family could make some of your gifts this year and save yourself money. “If you like making things for your garden, you’ll love concrete. Durable, beautiful, and inexpensive, it’s also surprisingly simple to work with. Best of all, it weathers elegantly, softening around the edges to become more picturesque with age. I already know from my cousin, Bill, about the rewards of working with concrete, so this book is right up my alley. I have three concrete planters that Bill made, and I love them. For the contest, all you have to do is click here, and enter your email address. You could win a copy of the book AND a $25 gift certificate to Home Depot AND a set of rubber molds. The publishers need your email to communicate with you if you win – they won’t share it with anyone else. Contest ends this Friday October 21st. If you click here, you can see step-by-step instructions on how to make adorable little concrete tealights. It looks so easy! I think they’d make really nice gifts. Hi pumpkins, and happy Tuesday! Welcome back to my latest theme week, Vertical Gardens and Living Artwork! Caution – Danger! Danger! Danger! 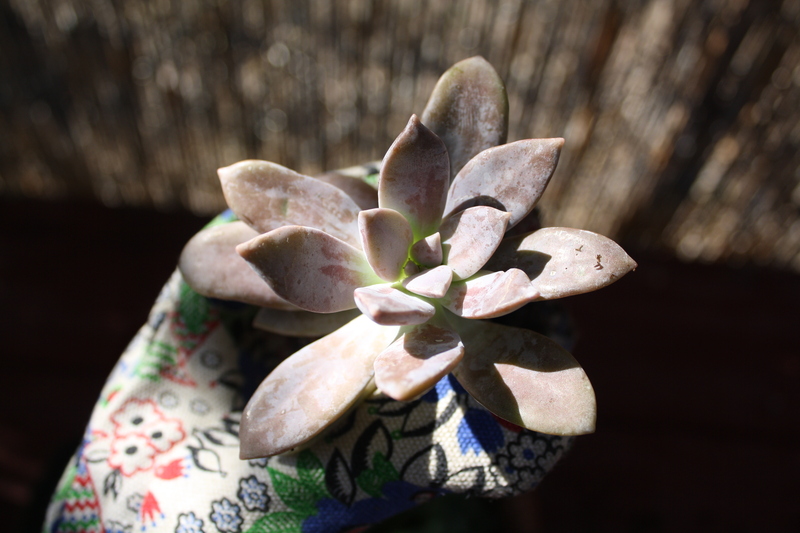 Many succulents contain sap so it’s important to wear gloves when handling them! The sap can irritate the skin and make your eyes swell, so be very careful to wash your hands thoroughly and often, and don’t touch your eyes! Houseplants in general are apt to be poisonous, so tread carefully. I don’t want anyone to get hurt or swollen or itchy while experimenting with houseplants, succulents or otherwise. 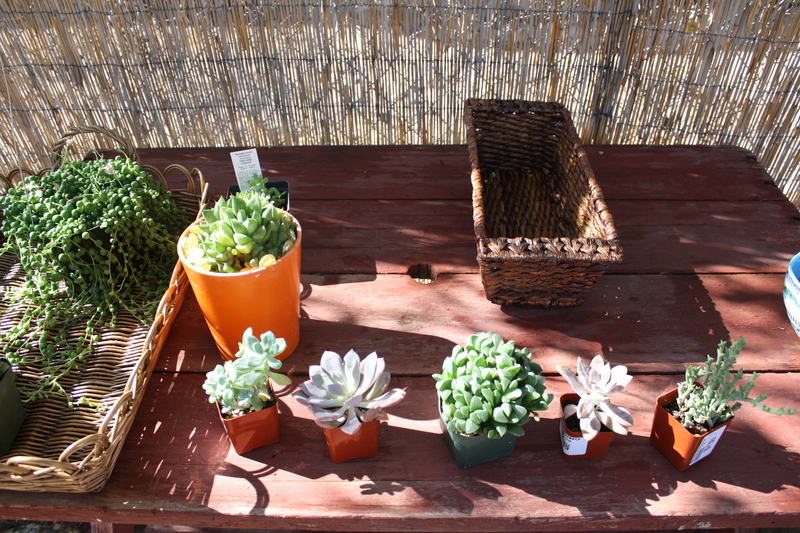 Danger aside, I still think succulents are a great way to introduce kids to nature. They’re juicy, they grow really fast, and they’re funky. 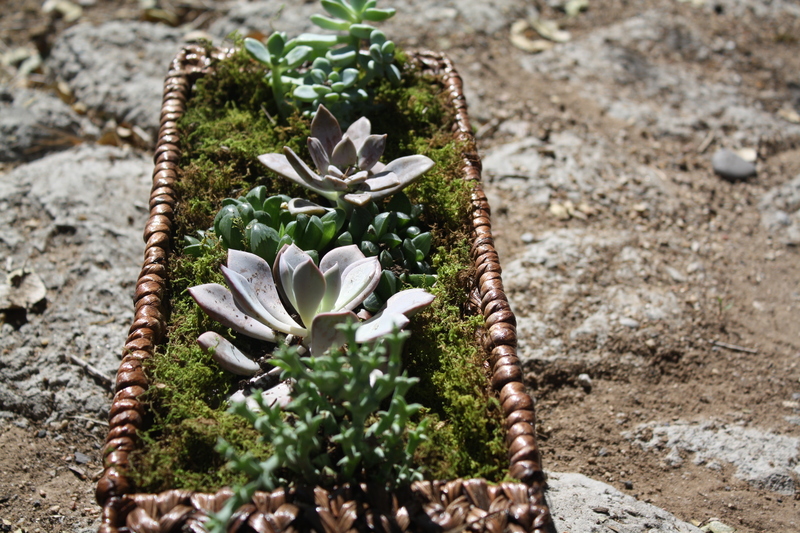 You can get a kid hooked on gardening for life with succulents, just play it safe, ok? Ok, good, we have a deal. There are a thousand ways to build your own wall hanging, there are a thousand containers and a thousand plants from which to choose. 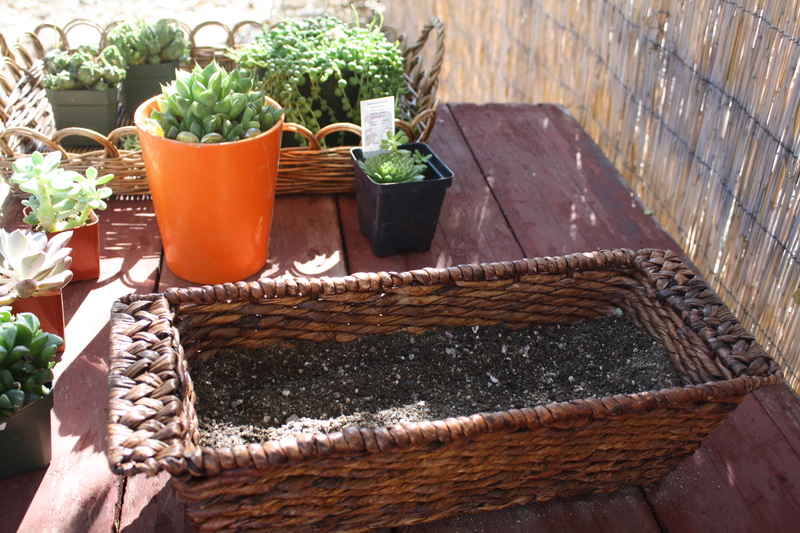 I’m going to show you how I made my most recent succulent garden in hopes that you get the general basics, and from there, you can let your creativity explode. I knew I wanted to create a design to hang outside in my garden, so I started with a basket that I liked the shape of -it was deep, but not so deep it would look weird hanging on a wall. 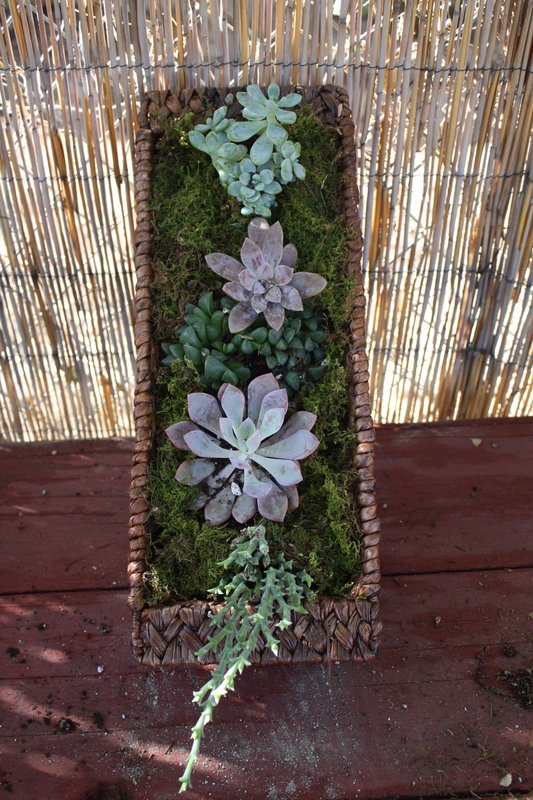 The plan is that after it’s all planted and rooted in, I can take it off the wall (or fence), drench the whole container with a hose until it’s thoroughly soaked, then hang it back up again. I suppose I could just spray it with the hose while it’s on the wall, but that seems, I don’t know, rude or something. How dork is that? Like mixing cake batter. Anyway, it was effective. 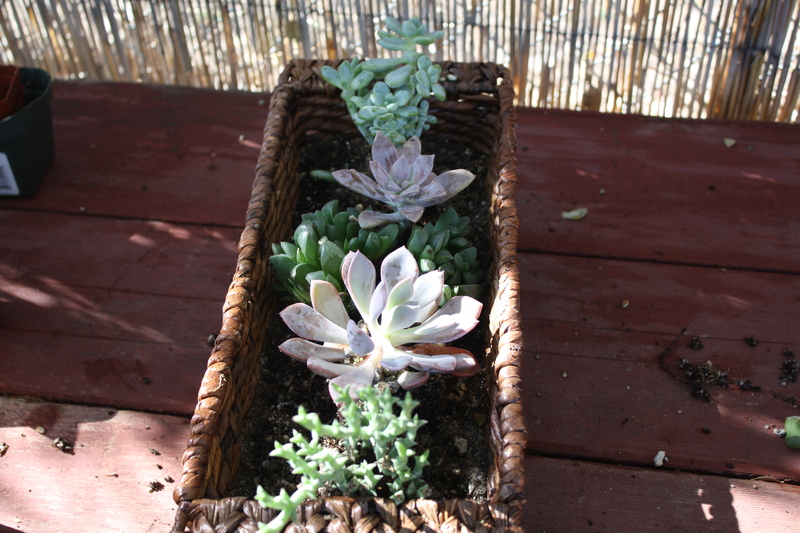 Succulents appreciate a porous mix of regular potting soil and tiny rocks or sand even. 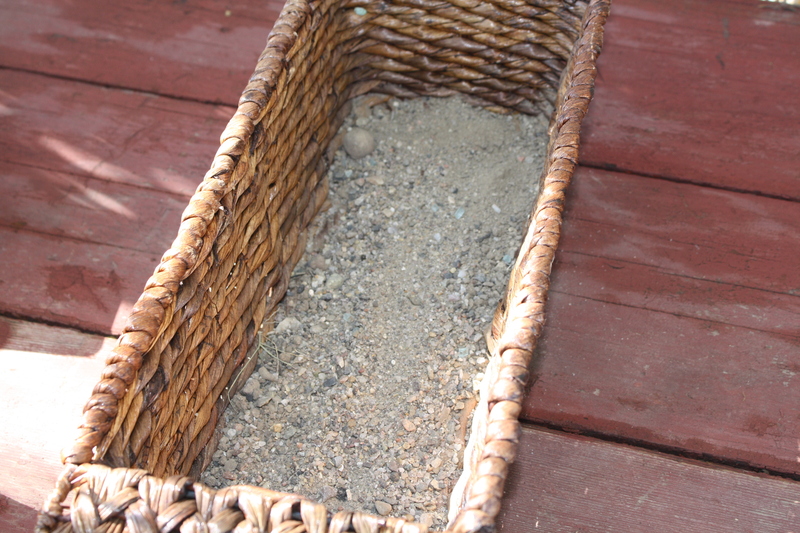 You don’t want to plant in all sand or rocks, because they won’t retain enough moisture for the plants to thrive. 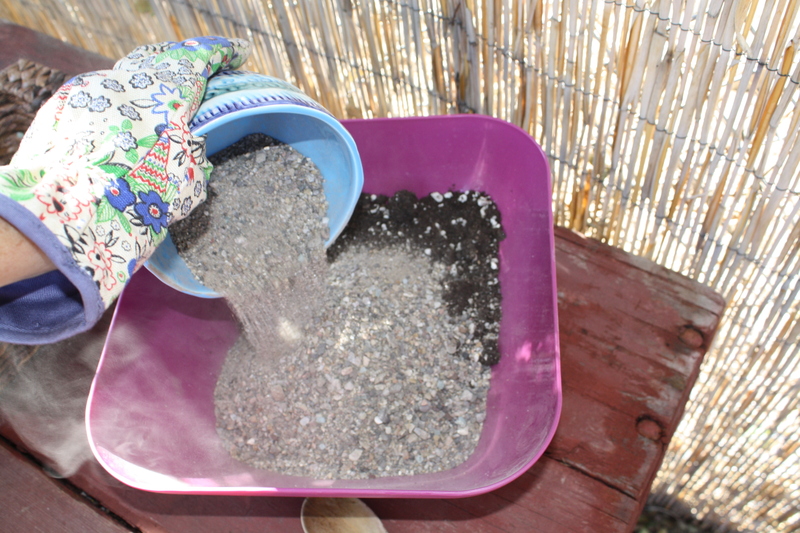 I decided not to secure the soil mixture like I had in yesterday’s post for a couple of reasons. One, I know this planter is going to stay indoors until spring, because it’s already September, and I don’t want to take any chances on these little guys getting too cold. 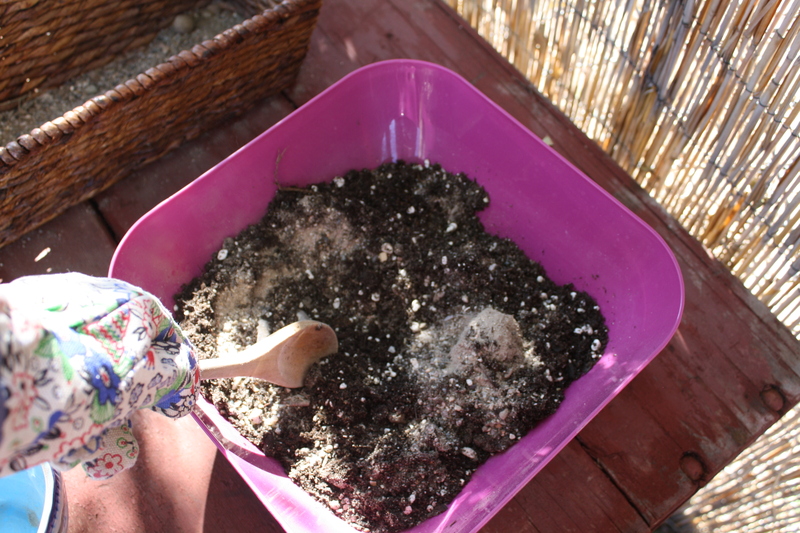 By spring, their roots will have secured so well in the soil, that I won’t need anything to help hold the soil in place. There’s one more reason, but I’m getting ahead of myself again. 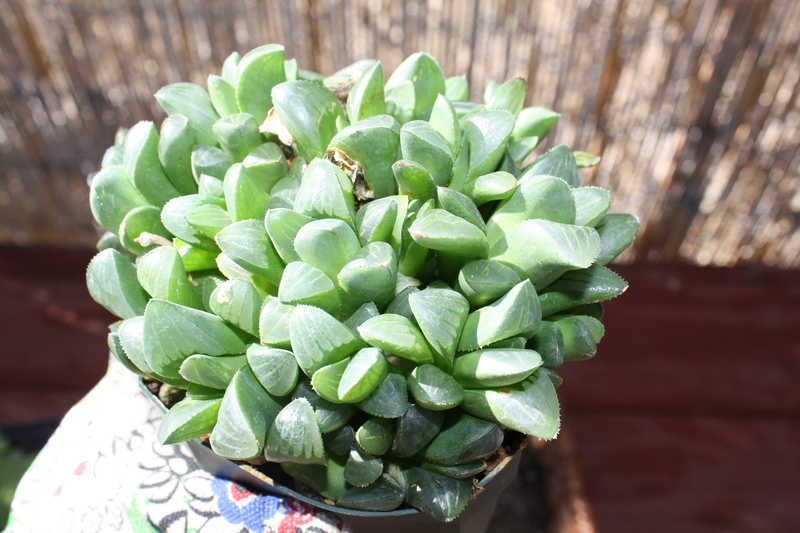 Haworthia what? cooperi? cymbiformis? bayeri? I mean, I don’t care, I’m going to love him anyway. I’ll probably name him Larry and forget all about his particular cultivar. But I’ve been trying to get the correct names for my readers who like to know. I looked at the labels while I was at the nursery, and asked an employee about them. He was about as useful as the label. This one was labeled, “Echeveria.” Thanks, that’s again super helpful. What type of Echeveria is it? I don’t know – after scrolling through pages and pages of pinkish bluish rosette succulents, they all start to look a little alike to me. My bad! Aw, they look cute in there! Ok, remember when I said I had one more reason for not securing the plants in the soil? It’s because I had another layer I wanted to add in order to help both secure the plants and retain moisture. See, I’m already wondering how these guys will do in our hot desert summers. Once they’re outside, even if they’re not in full sun, the heat is brutal. Well, it sure looks pretty now. I’ll be mindful of watering through the winter months. And if the moss turns all brown and gross looking, I’ll pluck it off. No harm, no foul. Ok, I can’t stand it completely upright right after I planted it, but did it spark your enthusiasm? I’d love to know if you decide to try making a living wall hanging of your own. For indoors or out. I’ll be back manana to continue Vertical Gardens and Living Artwork week. Instead of looking at my creations, we’ll check out what brilliant designers around the globe are creating – hint, they’re breathtaking projects! Hope to see you here!